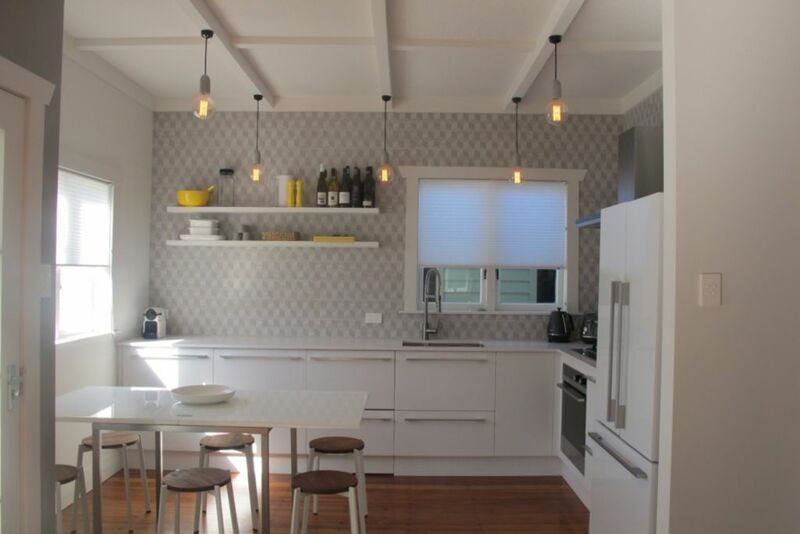 Enjoy Waihi Beach holidays at One Fyfe: a chic, sophisticated and stylishly comfortable bach just a few minutes’ walk from the popular north end of Waihi Beach. This unique seaside retreat has recently been renovated to a standard worth writing home about. No fusty, mismatching garage-sale furniture or outdated seashell designs here! One Fyfe’s interior is a haven of peace and tranquillity. A captivating coastal theme is woven throughout, creating a bright, breezy and effortlessly cool space that’s perfect for kicking back, relaxing and soaking up everything this stunning location has to offer. One Fyfe’s living area is presented as one airy space with a lounge, dining area and fully fitted kitchen complete with Nespresso machine and double DishDrawer. In the lounge, a muted palette of soft whites and greys is complemented by a golden rimu floor, while the kitchen is crisp and clean in matte white with a tonal stone bench and whitewash-effect tiles. The stylish bathroom is thoughtfully designed with an integrated utility area and underfloor heating for the cooler months. Our three bedrooms comfortably sleep up to seven adults, and are equipped with everything you need for a peaceful night’s rest. Laid-back hues and bold maritime blues are teamed with bright white furnishings and sumptuously soft fabrics to create a serene ambience and true home-from-home comfort. For our littlest guests, a travel cot provides a cosy place for sweet dreams of seaside adventures. Out back, One Fyfe boasts an enormous open space for children to play games and explore, with the added benefit of being fenced along the road frontage. Our amazing multi-storey tree house – complete with pirate flag, bean bags and a top deck with ocean views – provides hours of fun for kids young and old! Just 350 metres away is Waihi Beach itself, with nine kilometres of sweeping white sand and one of the safest surf breaks in New Zealand. Well presented and close to the beach. We enjoyed using the clean and modern kitchen and bathroom facilities. The shower was great! Unfortunately the beds are very uncomfortable and we did not sleep well on them, which was a shame. The bedrooms are well presented. Apart from the beds, we would highly recommend this lovely bach. We have had a wonderfull time in the One fyfe bach. Next to the beach we love it. The three of us enjoyed our stay. batch is compact but has been beautifully redecorated. it is only 5 minutes walk to the beach. A few minor niggles, the kitchen/lounge layout doesn't quite work and the tree house needs some TLC. This was my first visit to Waihi Beach in 40 years and we really enjoyed our stay. Waihi Beach is a very chilled, friendly place and is not full of pretentious posers and hideous "chilly bin" mansions , like the Mount/Papamoa area. We had a couple of issues with some damage from previous tenants but Becki and her local property manager dealt with things immediately which was awesome.